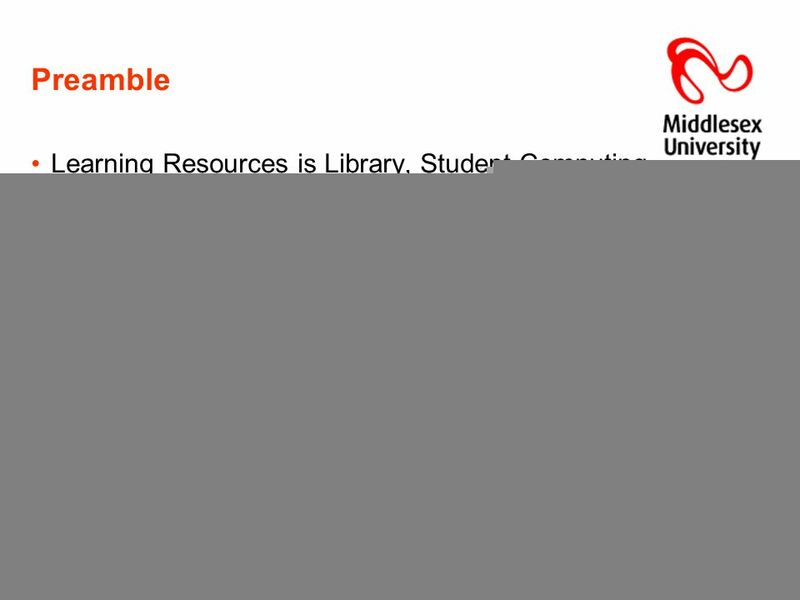 Developing a TEMPUS application Alan Hopkinson Technical Manager (Library Services) Learning Resources Middlesex University. 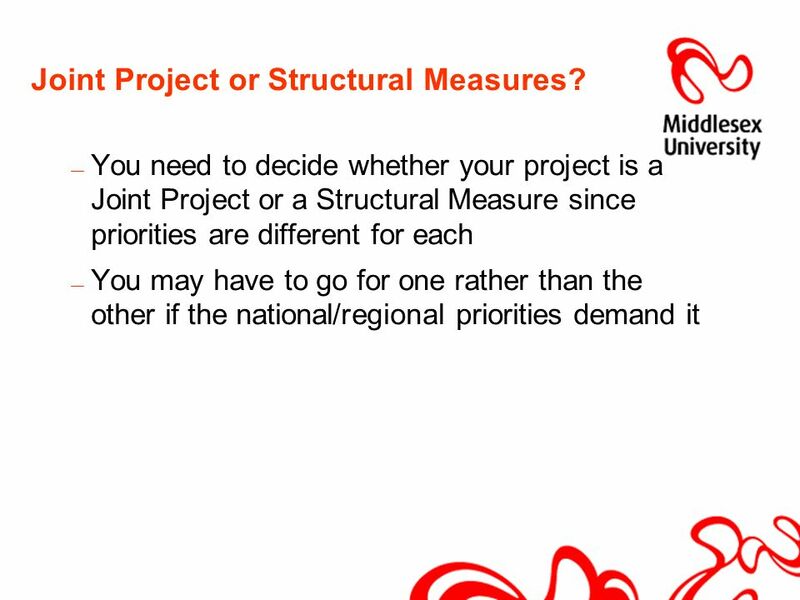 8 Joint Project or Structural Measures? 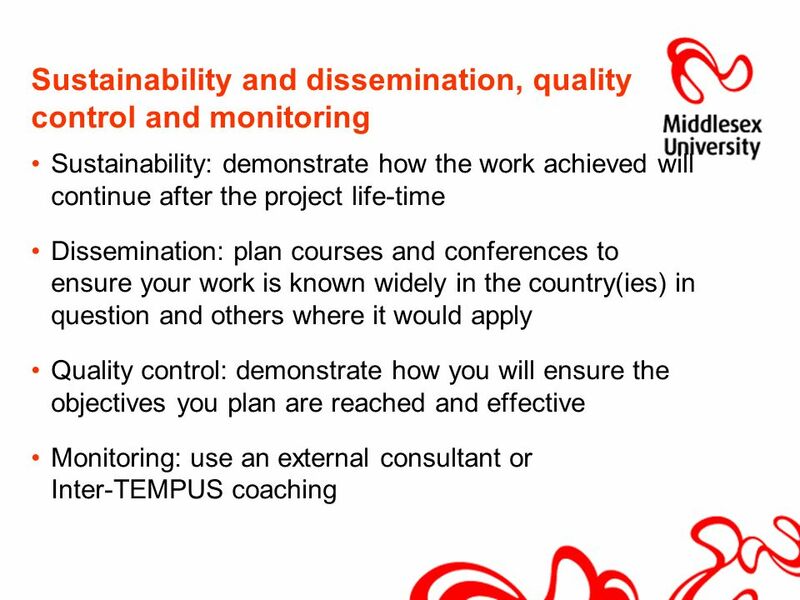 Joint Projects: projects with a bottom-up approach aiming at modernisation and reform on an institutional level. 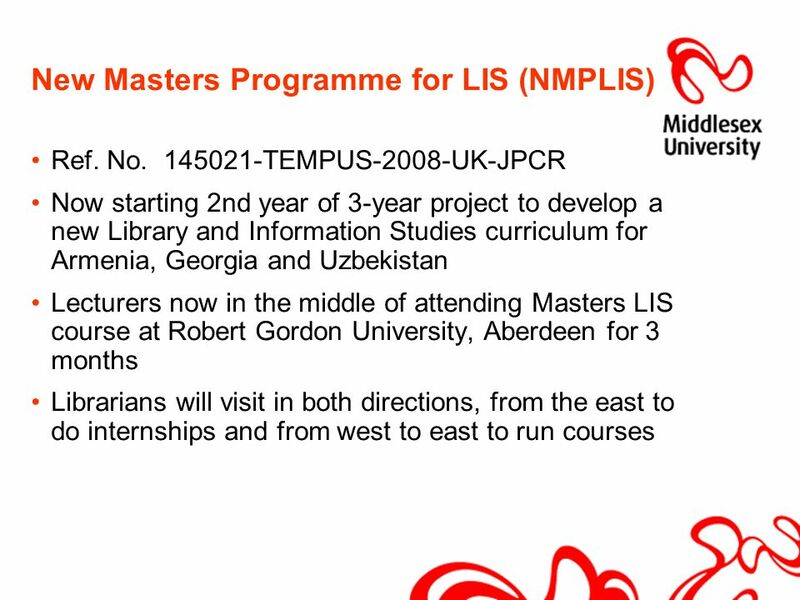 Joint Projects aim at transferring knowledge between universities.. from the EU and from the partner countries and between partner country entities. 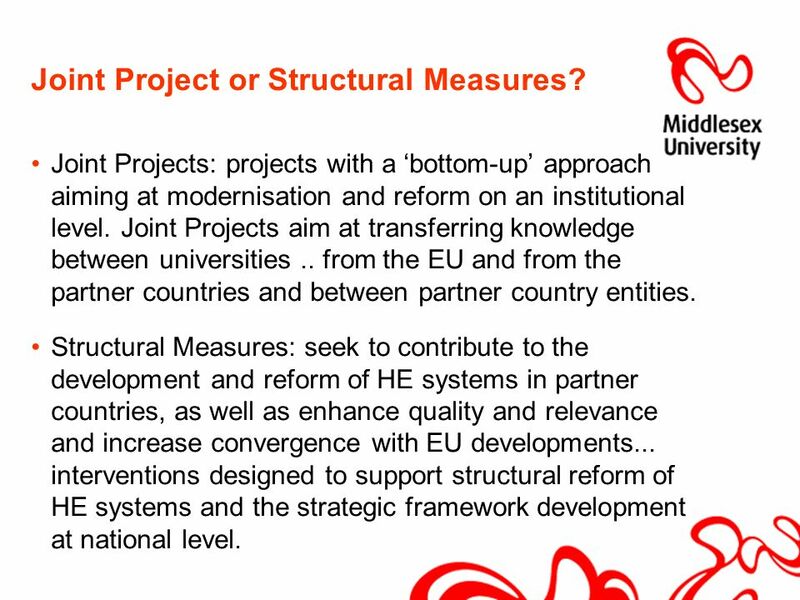 Structural Measures: seek to contribute to the development and reform of HE systems in partner countries, as well as enhance quality and relevance and increase convergence with EU developments... interventions designed to support structural reform of HE systems and the strategic framework development at national level. 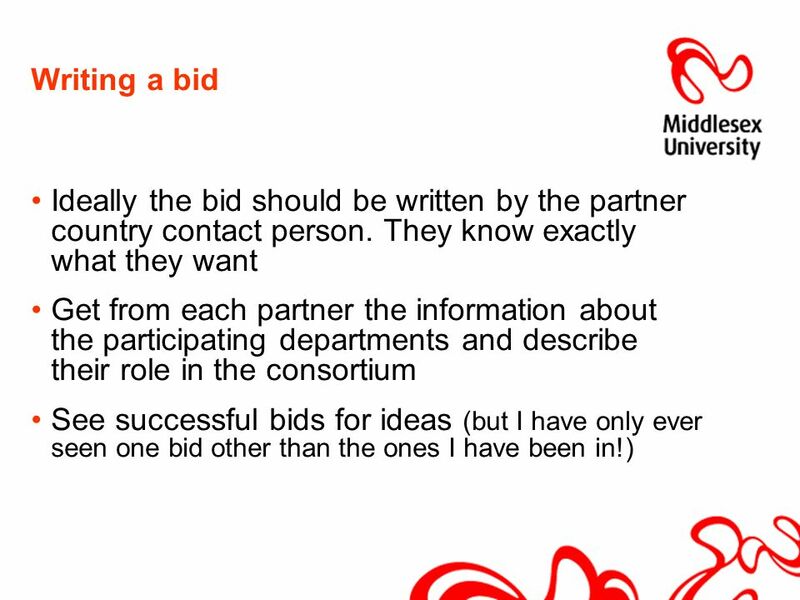 12 How many partners do you need? 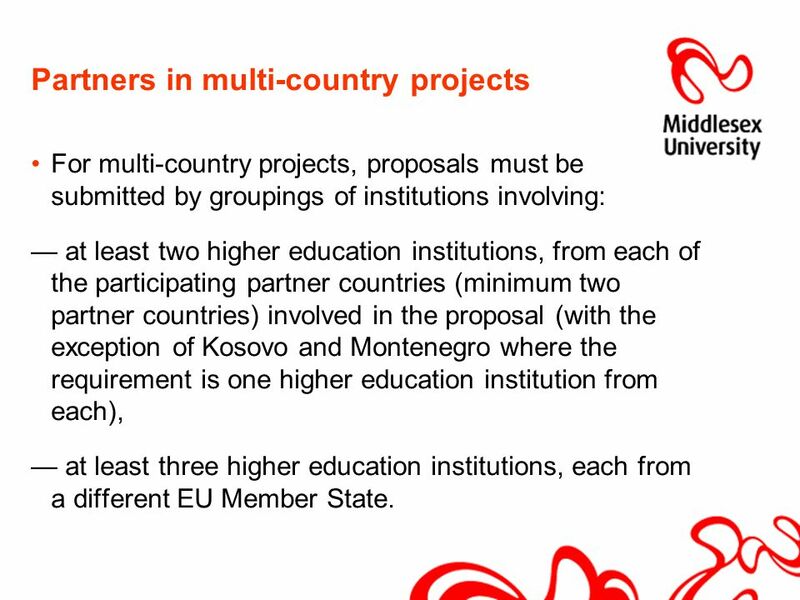 For national projects, proposals must be submitted by groupings of institutions involving: at least three higher education institutions from a partner country (only one required from Kosovo and Montenegro) at least three higher education institutions from the EU, each from a different EU Member State. 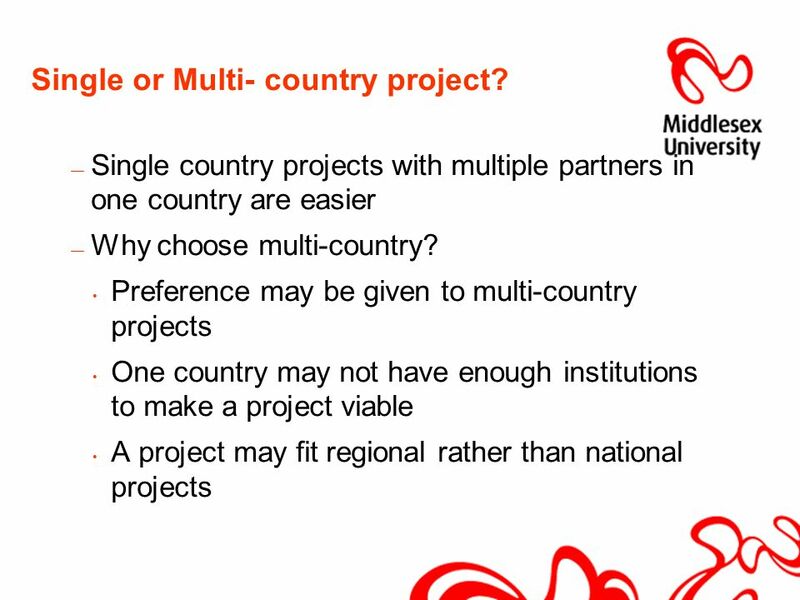 13 Partners in multi-country projects For multi-country projects, proposals must be submitted by groupings of institutions involving: at least two higher education institutions, from each of the participating partner countries (minimum two partner countries) involved in the proposal (with the exception of Kosovo and Montenegro where the requirement is one higher education institution from each), at least three higher education institutions, each from a different EU Member State. 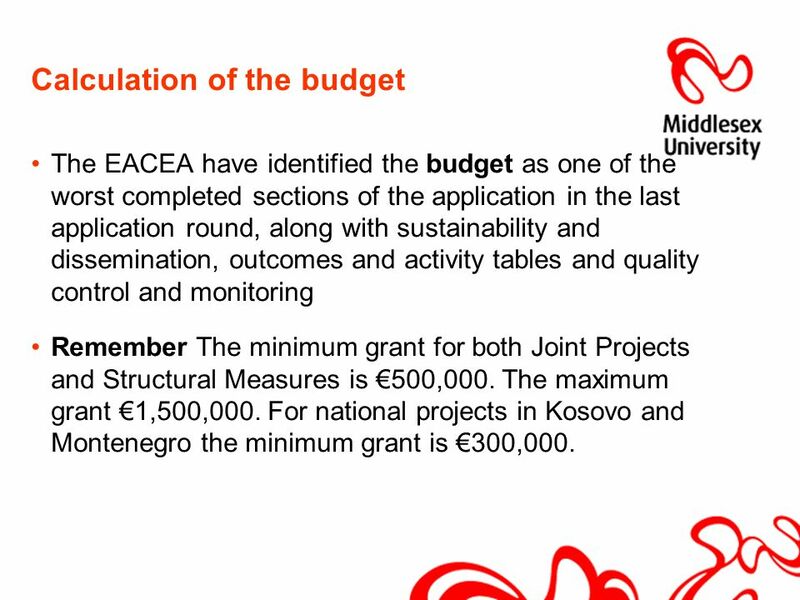 17 Calculation of the budget The EACEA have identified the budget as one of the worst completed sections of the application in the last application round, along with sustainability and dissemination, outcomes and activity tables and quality control and monitoring Remember The minimum grant for both Joint Projects and Structural Measures is 500,000. The maximum grant 1,500,000. 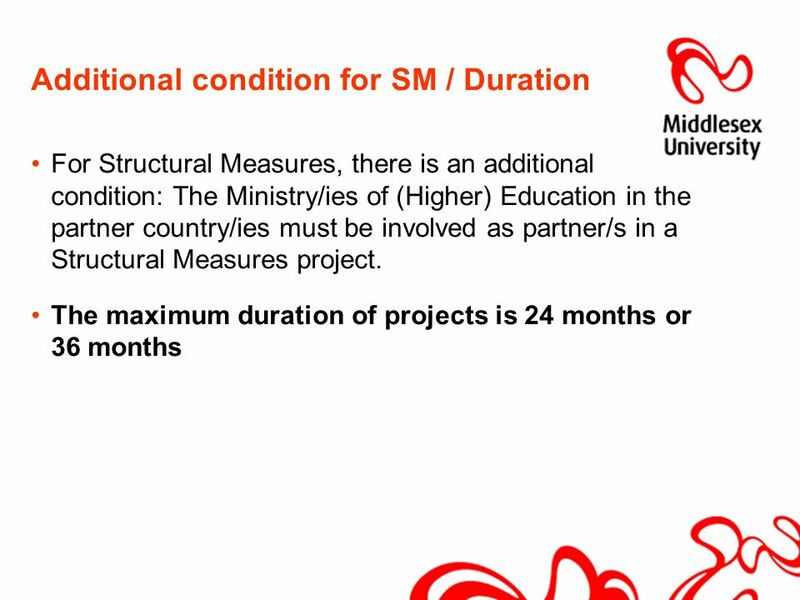 For national projects in Kosovo and Montenegro the minimum grant is 300,000. 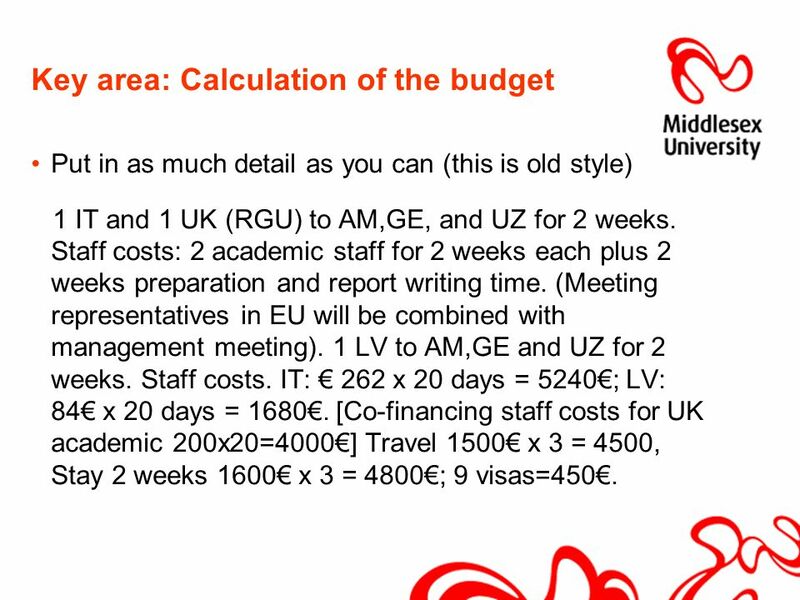 18 Key area: Calculation of the budget Put in as much detail as you can (this is old style) 1 IT and 1 UK (RGU) to AM,GE, and UZ for 2 weeks. 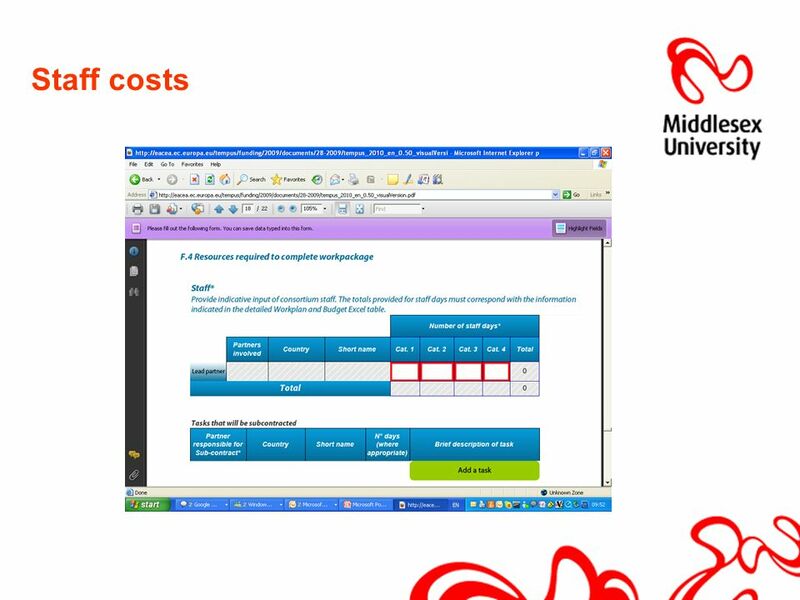 Staff costs: 2 academic staff for 2 weeks each plus 2 weeks preparation and report writing time. 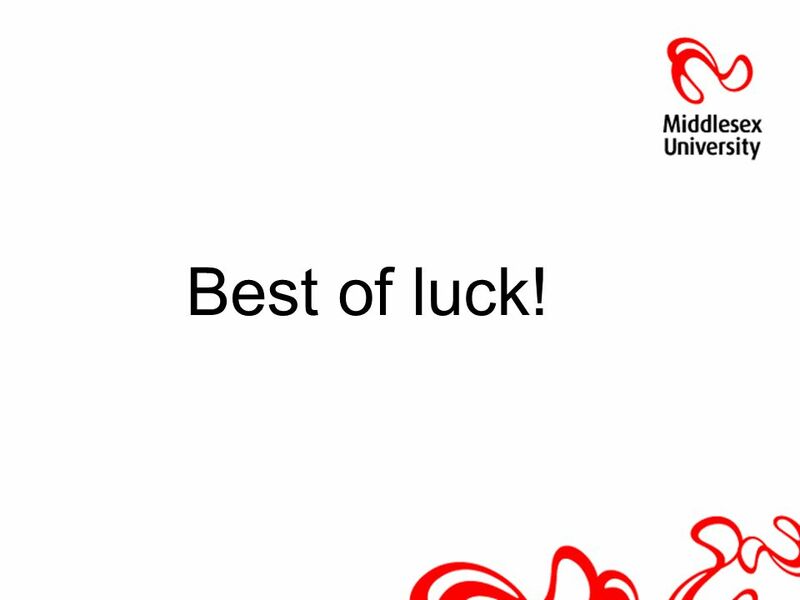 (Meeting representatives in EU will be combined with management meeting). 1 LV to AM,GE and UZ for 2 weeks. 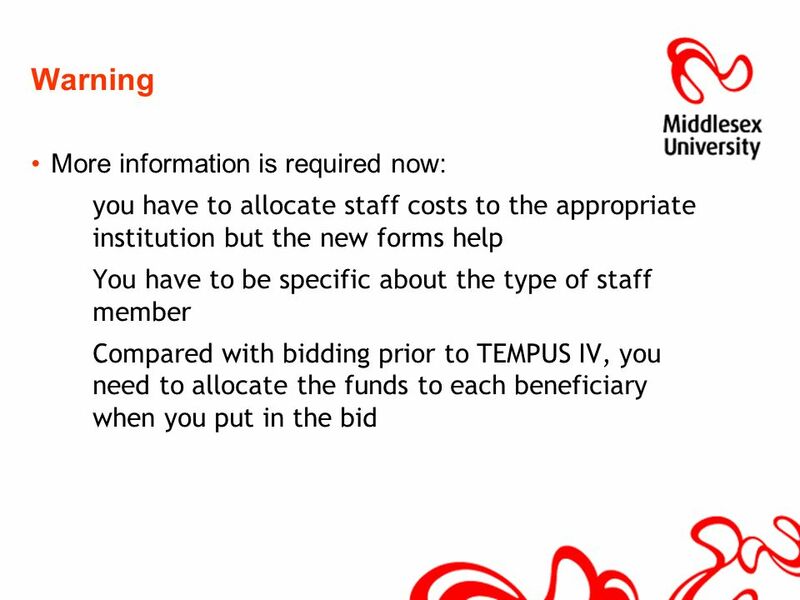 Staff costs. IT: 262 x 20 days = 5240; LV: 84 x 20 days = 1680. 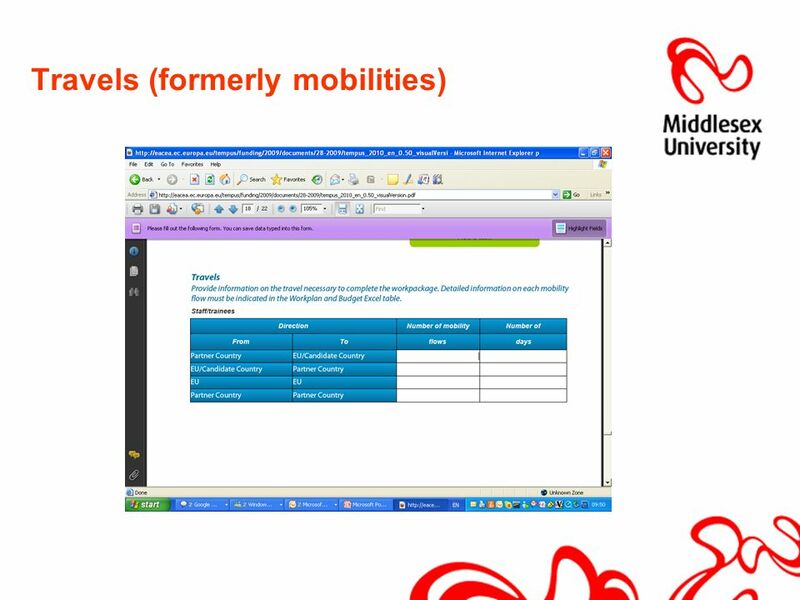 [Co-financing staff costs for UK academic 200x20=4000] Travel 1500 x 3 = 4500, Stay 2 weeks 1600 x 3 = 4800; 9 visas=450. 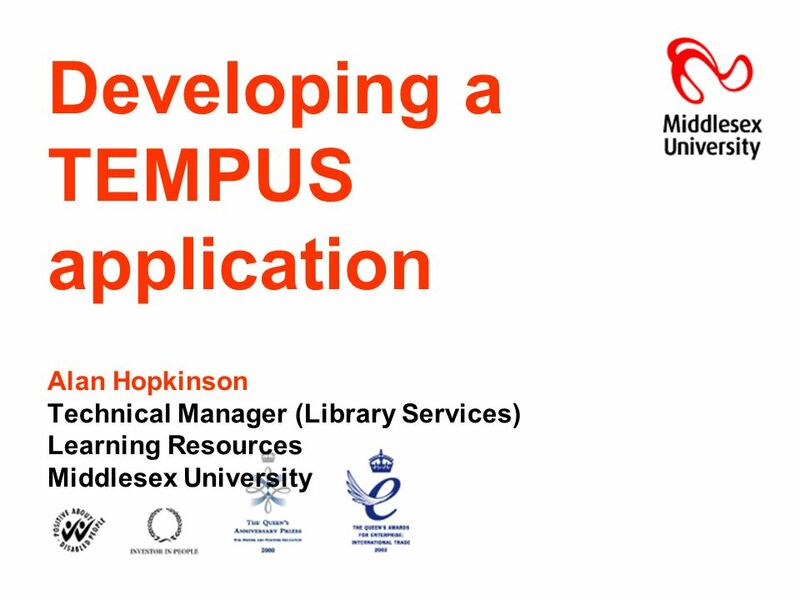 Download ppt "Developing a TEMPUS application Alan Hopkinson Technical Manager (Library Services) Learning Resources Middlesex University." 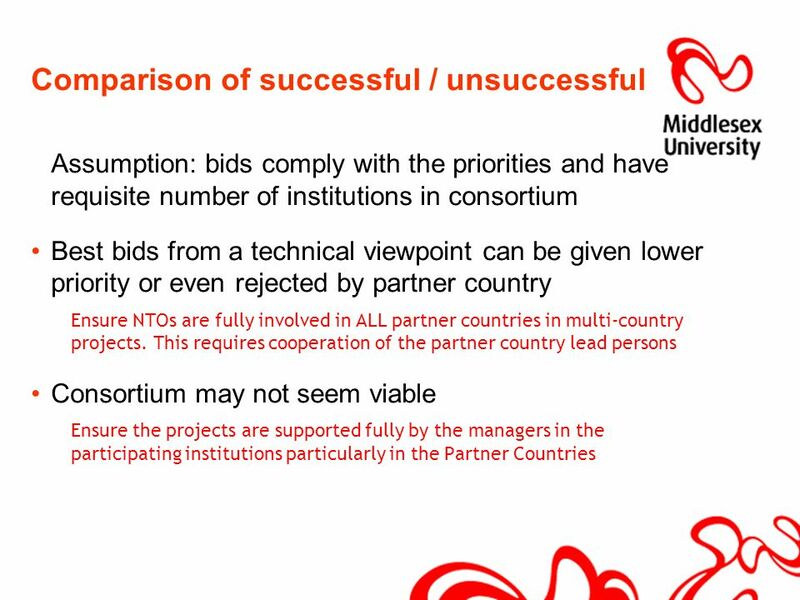 INTERREG III B, PHARE CBC and TACIS CBC Programme -Combination of EU instruments for transnational co- operation in the BSR CEEC\NIS participation in BSR. 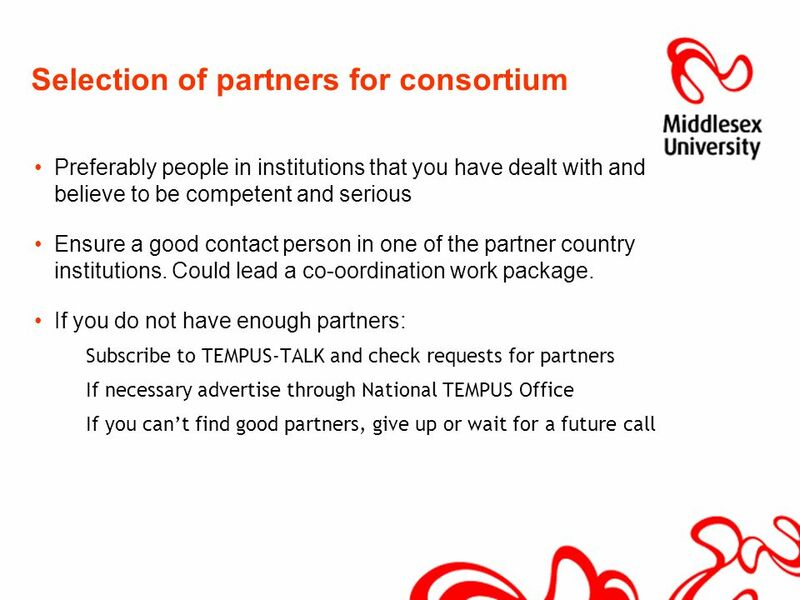 DOs and DONTs Joan-Anton Carbonell Kingston University EC External Expert TEMPUS Modernising Higher Education TEMPUS INFORMATION DAY. 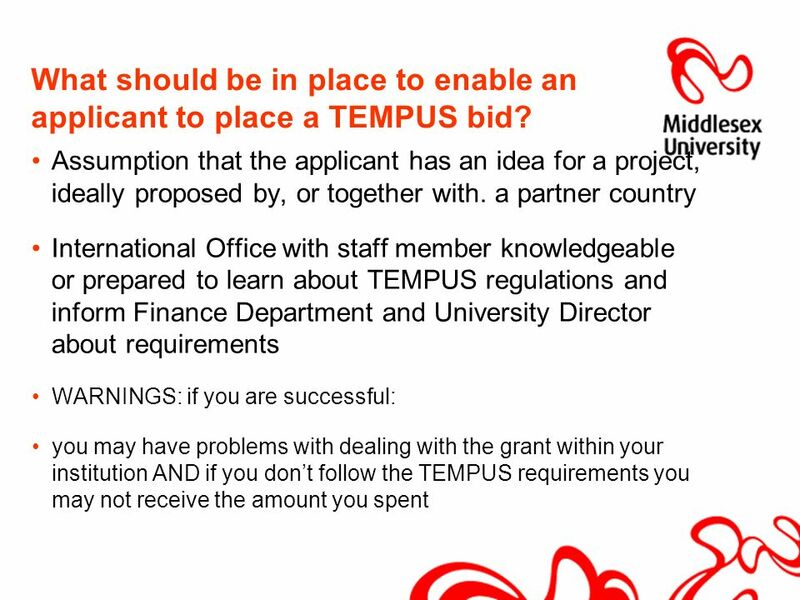 TEMPUS IV1 FOURTH CALL OCTOBER 2010 PREPARING AN APPLICATION. 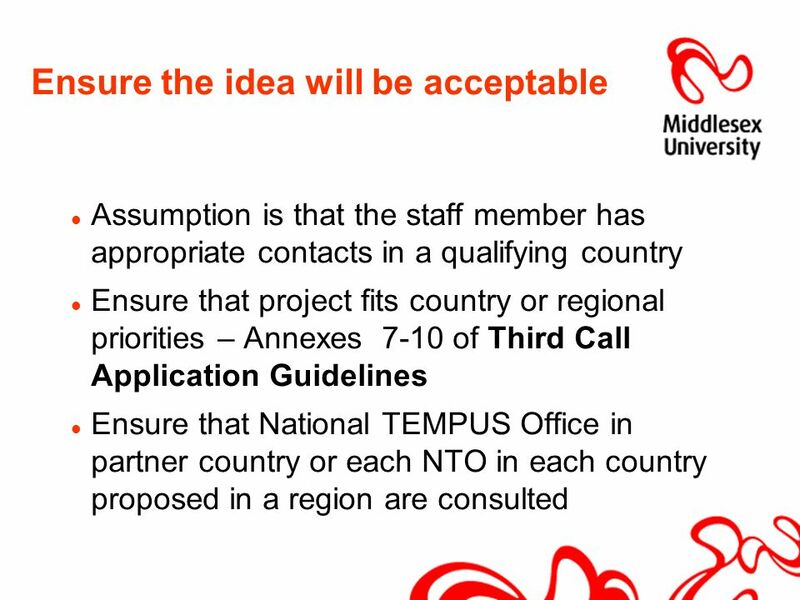 1 Tempus Information Day First Call for Proposals Tempus IV London, 22 February 2008 European Commission. Event Title Name Erasmus Co-ordinators Workshop June 2012 Erasmus For Beginners Rebecca Rogers. ERASMUS STAFF PLACEMENTS First year experiences at UCY ERACON Conference 8 th -11 th, May 2008, Lisbon. National Information Seminar The management of IPA funds and the role of the Thessaloniki Liaison Office Zagreb, 21 st February 2012 Kirill Dimanopoulos. 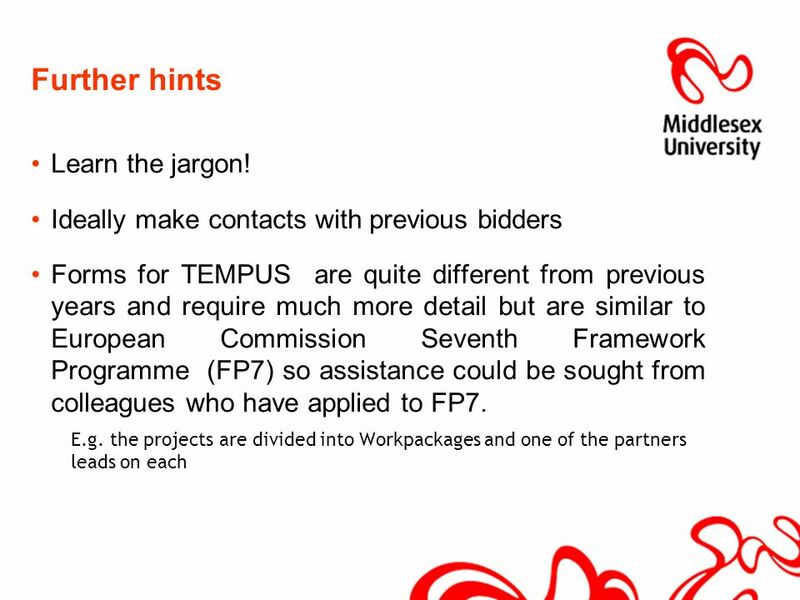 Programma TEMPUS: Le opportunità della nuova call for proposals 1 INFO DAY ERASMUS MUNDUS Roma, 17 gennaio 2013. 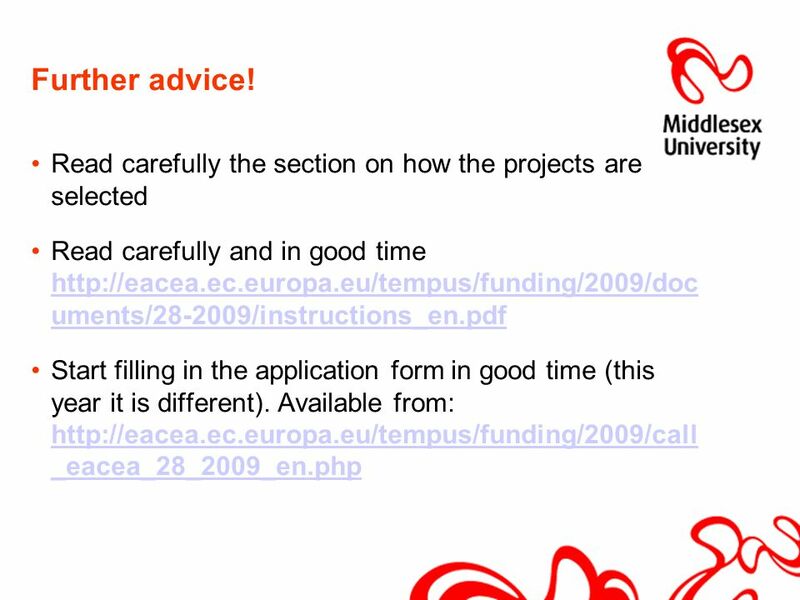 Erasmus Mundus The programme in brief. 1987 / 2007 ERASMUS 20. 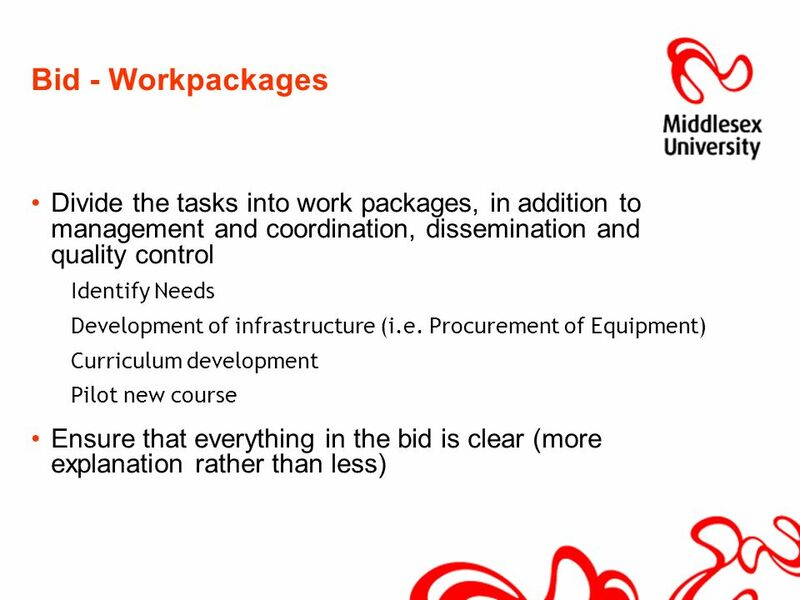 Erasmus - Specific objectives Support the realisation of a European Higher Education Area Reinforce the contribution of higher. 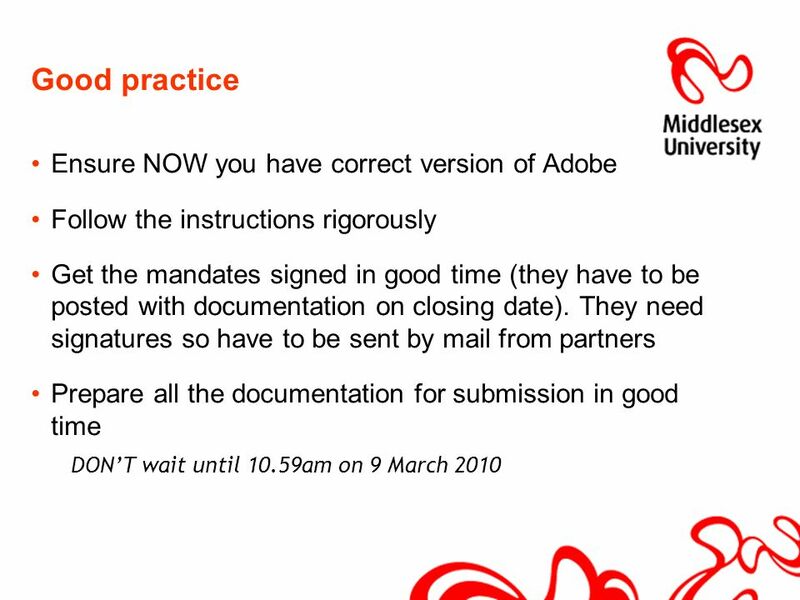 Progress and Financial Reporting Geoff Butters, MDR Partners 05 March 2012, KB, The Hague. GENIUS T4 - September 2014 GENIUS T4 Teleconference X. Luri. GENIUS T4 - September 2014 GENIUS T4 Teleconference 17-9-2014 X. Luri.